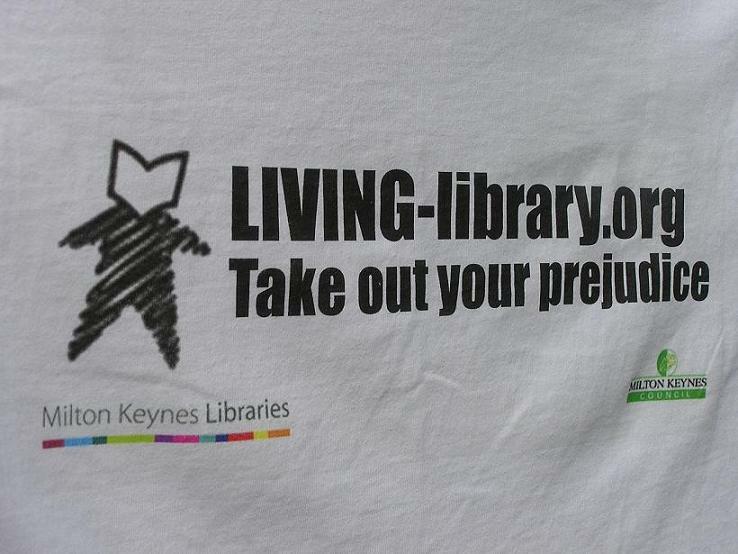 Just back from a great afternoon at Milton Keynes’ Living Library. The original idea behind the Living Library – as you’d guess from the shot above – was to give borrowers a chance to meet people about whom they might already have fixed ideas. The local version expanded into the chance to meet all sorts of interesting folk – not only the ‘living books’ but the readers, who turned out to be a fascinating bunch. I guess we all move in our own restricted circles, and in mine I don’t think there’s anyone who can chat to customers across her supermarket till in six different languages, or who earns a living wage as an artist, or who is brave enough to speak publicly about overcoming depression. Ever heard of Korfball? I hadn’t, but thanks to a conversation in the Green Room I now know it’s a sport that even I might have taken up at school, had it been on offer. Several budding writers dropped by to chat about promising projects, and it was good to think through my own strategies for getting work done (none of which is entirely successful, to be honest). Some people came because they enjoy reading and wanted to meet a writer, and others because they thought the Living Library was a fine idea and wanted to support it. Everyone involved in this venture was taking a risk of some kind – the staff that nobody would want to join in, the readers that their book would be disappointing, and the books themselves that they might disappoint their readers – or that nobody would want to talk to them in the first place. I guess the whole thing was an exercise in trust – and in discovering the extraordinary nature of seemingly ordinary people.